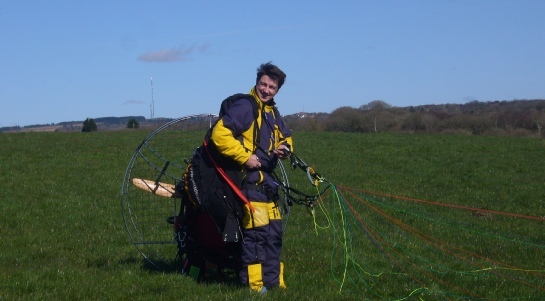 I am married to my wife Louise and have two Children, I first learnt to fly 12 years ago and after saving have managed to purchase a powered parachute ( Aerochute Trike ). I love the freedom that flying brings and the appreciation of life it gives. It made me feel I wanted to do something good with this passion I have so it set me thinking, perhaps I could raise money for charity by doing something imaginative and raise awareness for a good cause . But what charity? The answer came quickly, the loss of my dear friend James Stonehewer to cancer. So many of us know and love people who are either fighting this dreadful disease or have been taken by it . It's with this in mind that me and a group of slightly mad individuals are taking to the skies to raise money for Cancer Research by flying from Coast to Coast in our slightly different flying machines ' Aerochute Trikes' . This event will take us several days and we will need to stop along our route for fuel and the weather. We will carry our tents with us and will camp as we fly towards our goal.